The Reds’ 4-0 win over Newcastle on Boxing Day means they are six points ahead of second place Tottenham and seven ahead of Manchester City. Arsenal have had three disappointing results in the last five games, losing to Tottenham in the Carabao Cup, Southampton in the league and drawing to Brighton. Who will claim all three points? Choose your price boost at MansionBet! MansionBet offer 28/1 Liverpool or 100/1 Arsenal to win! Max bet £1! New customers joining via specific promo link only. To be eligible player must join via specific promo link. £10 minimum deposit required. Qualifying bet must be placed at normal odds. Max stake £1. Additional winnings paid as Free Bets within 48 hours of qualifying bet settlement. Only deposits with UK credit/debit cards eligible. Free bets expire after 7 days and stake not included in returns. T&Cs apply. More enhanced odds on Liverpool v Arsenal? Online bookmakers are offering tons of enhanced odds offers on this match! We have collated the best promos..
Get 30/1 Liverpool to win vs Arsenal at BetVictor. Max bet £1! MoPlay offer 19/1 Liverpool to beat Arsenal + Both Teams To Score! Maximum stake £1.Return paid in real cash.Bet must be placed on "Moplay Upgrades" market within the Liverpool vs Arsenal match.Liverpool vs Arsenal 29/12/2018 Premier League Fixture.Pre-event only.No Cash Out.Single Only.Cannot be combined with other bets.One bet per customer.18+.Stake/Player restrictions and General Betting Rules apply. 50/1 Arsenal to win! PAID IN CASH! Get 50/1 Arsenal to beat Liverpool! Winnings paid as cash! Maximum bet £1. Estabilished in 2002 and awarded the prestigious ‘Online Casino Operator of the Year’ at the International Gaming Awards (IGA) 2018, the Mansion brand is recognized as one of the leading providers in the online gambling industry. Their top-notch Mansion casino offer a variety of popular casino games, including slots and live games. The company is now diversyfying their product portfolio into the sports betting arena, utilising the strength and heritage of the Mansion brand name and aiming to offer an industry-leading sportsbook product. Their betting section will be powered by SBTech and its innovative and uniquely configurable Chameleon360 iGaming platform. BetAndSkill readers who would like to try out Mansion Bet are entitled to a huge welcome bonus. Get a 50% betting bonus up to £50 on your first deposit with bonus code MB50! The promotion is available to qualifying customers from 27/12/2018 at 13:00 GMT and expires on the 29/12/2018 at 17:30 GMT. Offer is available for new customers who have not previously made a deposit in MansionBet, residing in the UK and Ireland only. This offer is available for customers depositing with a UK Debit/Credit card only. All other payment methods are not eligible. 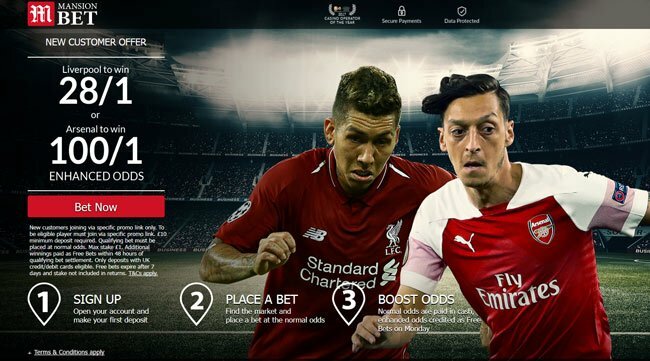 To be eligible for this offer, you must deposit a minimum of £10 and place, as your first 'real money' bet after opening your account, a single stake of at least £1 on Liverpool to beat Arsenal or at least £1 bet on Arsenal to beat Liverpool at the normal advertised odds on the match winner market only. Void, or bets that are Cashed Out, either fully or partially do not qualify. Free bets expire after 7 days and the free bet stake is not included in any returns. Free Bets cannot be redeemed for cash at any point. Free Bet stakes do not count towards qualifying bets for any other promotional offers advertised by MansionBet. "Get 28/1 Liverpool or 100/1 Arsenal to win at MansionBet (Premier League Enhanced Odds - 29.12.2018)"